EAST PEORIA – Tim Elder, Bonita Springs, Florida, formerly of Peoria, was named the 2014 Illinois Central College Distinguished Alumnus by the ICC Alumni Association. The award was officially presented during the Illinois Central College May commencement ceremony held in the CougarPlex on the East Peoria Campus. Elder started at ICC when the college first opened in 1967. Through his corporate career, he held a variety of leadership positions with Caterpillar Inc. during his 40-year tenure there, including Director of Public Affairs with responsibility for internal and external communications, governmental affairs, community relations, the Caterpillar Foundation and more. He was a key advisor for Caterpillar chairmen Glen Barton and Jim Owens and led the Caterpillar Foundation during a time of global growth. He has an extensive list of community boards on which he has served, including the Children’s Home, Wildlife Prairie Park, the Nature Conservancy in Illinois, Habitat for Humanity, and the Chamber of Commerce (both at the local and state level). 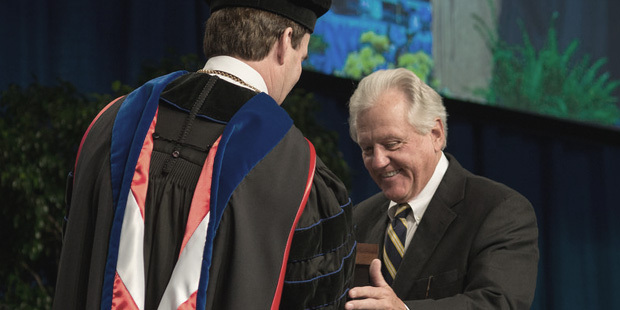 At Illinois Central College, he served as a member of the board of trustees, and he and his wife, Linda, have been loyal supporters of the ICC Educational Foundation, including establishing a scholarship to help current students. The ICC Alumni Association accepts nominations for the Distinguished Alumnus Award throughout the year. For more information on the ICC Alumni Association or the ICC alumnus award, email [email protected].